On Friday 24th November, The Castle and Falcon in Balsall Heath will be hosting Singing for Supper, a live gig with a somewhat stellar line up – You Dirty Blue, Sofa King, Alfresco Love Sounds, The Chalet Lines will all be performing for only a £5.50 door charge. For online ticket sales, click here. With each act worth the ticket price to just see them on stage, you’ve got three. Not a bad way to spend your money on Black Friday. 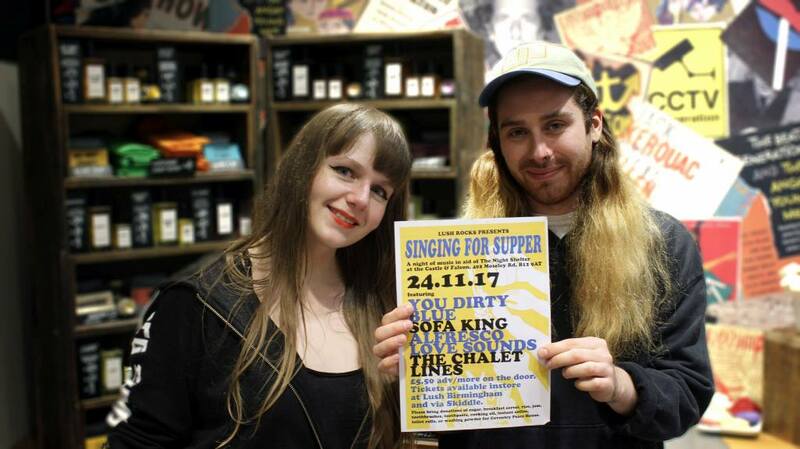 Birmingham Review caught up with Lydia Brookes, one of the Singing for Supper promoters and a ‘Lush Ambassador’, to ask what made them foray into the world of music promotions on arguably the busiest retail day of the year. “Homelessness is a huge problem,” explains Brookes, “we see ‘rooflessness’ every single day. It’s an issue close to our hearts at Lush and we wanted to work with this charity (The Night Shelter) because they’re part of such an important community resource”. The Night Shelter is one of the services of support available at the Coventry Peace House, a collection of renovated terrace houses that work on a portfolio of charitable endevours – including projects “to make the area more environmentally friendly, to give people safe spaces and places to learn,” tells Brookes. “We care a lot about this organisation because it’s so small but it’s doing so much. It’s quite unique and we really got behind their ethos”. But this event is looking at a broader problem than just homelessness, which in itself is a growing killer on the bitter cold streets of the UK. Lush Rocks, a name born from the retailers move into charitable music promotions, hopes their Singing for Supper gig on Friday 24th November will help raise both “money and public awareness” for the plight of those lost in the UK’s immigration cracks, whilst encouraging “people to think about the choices they’re make in and help in any way they can”. But charitable endevours aside, Singing for Supper is a gig simply well worth the door charge – especially with You Dirty Blue on the bill, a Tamworth alt-rock two piece who recently supported Wolf Alice on the first day of their UK tour and are pegged for big and bright things in 2018. With all the acts “doing it voluntarily”, Singing for Supper at The Castle and Falcon on Friday 24th November should be able to raise a decent chunk of change for The Night Shelter – a support service that is especially pertinent at this time of year. And if you are fighting your way to bargain blissteria this Friday, Lush Birmingham are also asking for donations of “non-perishable food items with a high energy content, things like jam and sugar. Also simple toiletries, so toothpaste, tooth brushes, toilet roll. And blankets. Just think ‘if I had to get buy on very few things, what would I need’”. 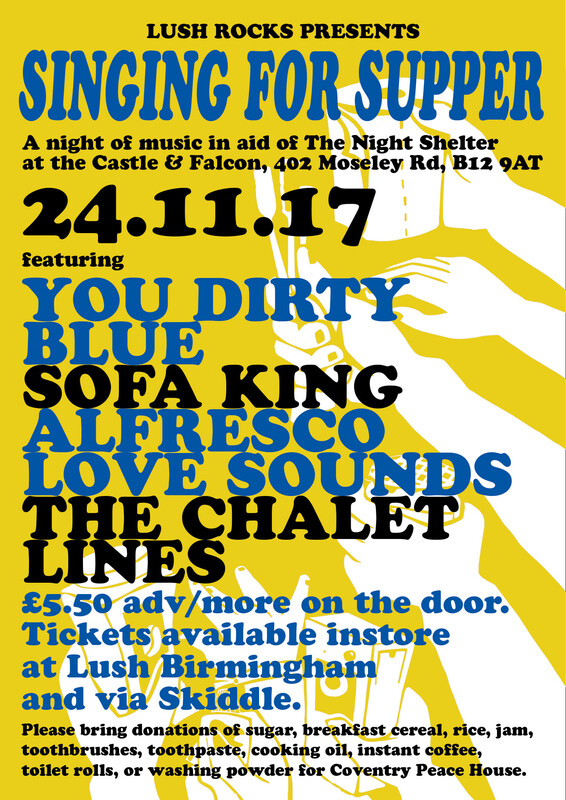 Singing for Supper comes to The Castle & Falcon on Friday 24th November, with You Dirty Blue, Sofa Kings, Alfresco Love Sounds and The Chalet Lines performing – as presented by Lush Rocks (from the Ambassadors Team at Lush Birmingham). All money raised from the gig will go to support The Night Shelter at the Coventry Peace House – a shelter for refugees, asylum seekers and people who have ‘no recourse to public funds’. For online gig ticket sales, click here. Lush Birmingham are also looking for donations of non-perishable food items, toiletries and FMCGs such as sugar, breakfast cereal, rice, jam, toothbrushes, toothpaste, cooking oil, instant coffee, toilet roll, or washing powder.